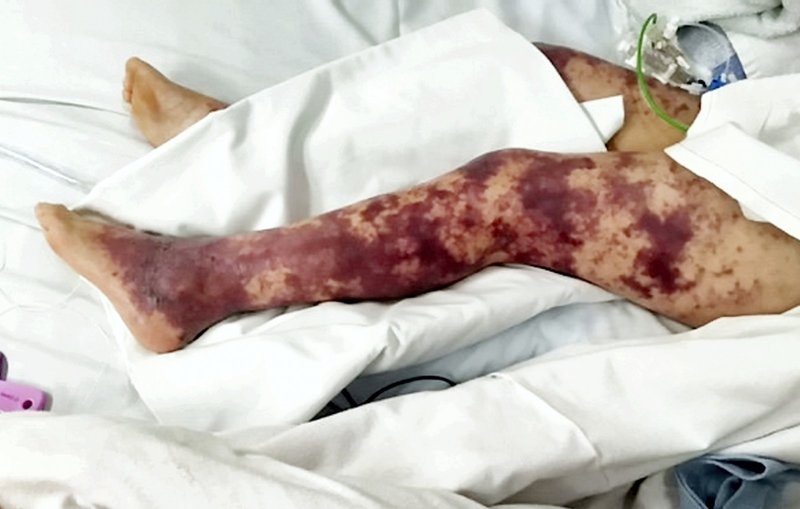 A seven-year-old girl who was struck down with meningitis B days after being a bridesmaid at her parents’ wedding will have her foot amputated to save her life. 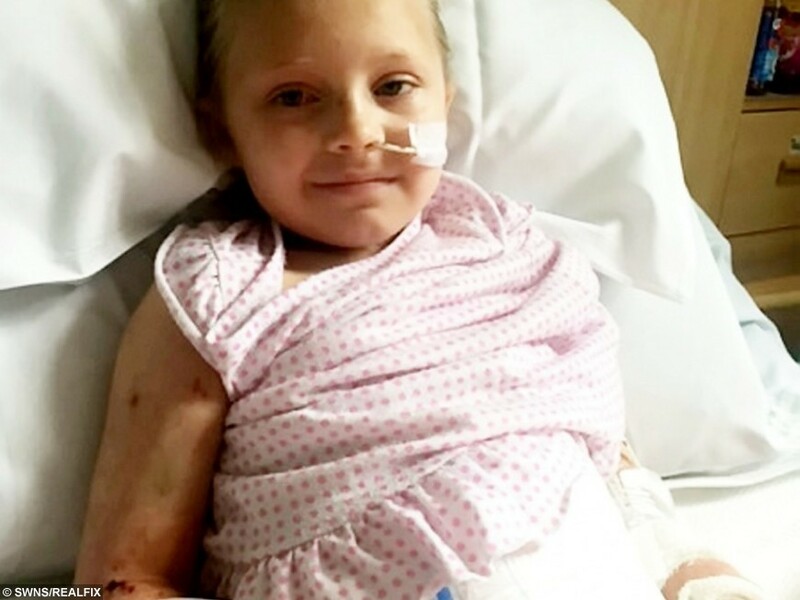 Brave Brogan-Lei Partridge contracted a deadly strain of the disease while she was on her mum Aimee and dad Craig’s honeymoon. Shocking pictures taken in hospital show the youngster with a horrific rash completely covering both of her legs. Another image shows the schoolgirl lying in a bed with tubes and wires coming out of her tiny body. Aimee, 25, and Craig, 29, released the pictures of their daughter in Birmingham Children’s Hospital to raise awareness about meningitis B.
Trainee midwife Aimee said: “This week has totally changed my outlook on life. “It’s shown what’s important and what isn’t, who’s there and who isn’t and people who just want a bit of gossip in comparison to those who genuinely care. “All the little things we thought were important to us suddenly aren’t anymore. “Me and Craig just want to remind everyone how overwhelmed and grateful we are for all the help and offers we’ve received from people near and far. Car parts worker Craig added: “We would like to raise awareness for meningitis B and the symptoms. Brogan, who lives in Bartley Green, Birmingham, was on her parents’ honeymoon in Newquay, Cornwall, with her brother and two sisters when the meningitis struck. 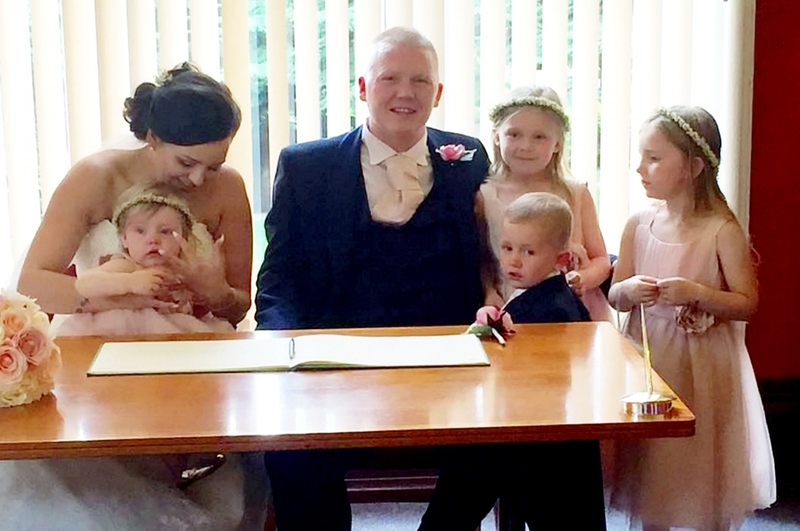 She first went down with a suspected eye infection after her parents’ wedding, which took place in the Malvern Hills in Worcestershire on June 18. 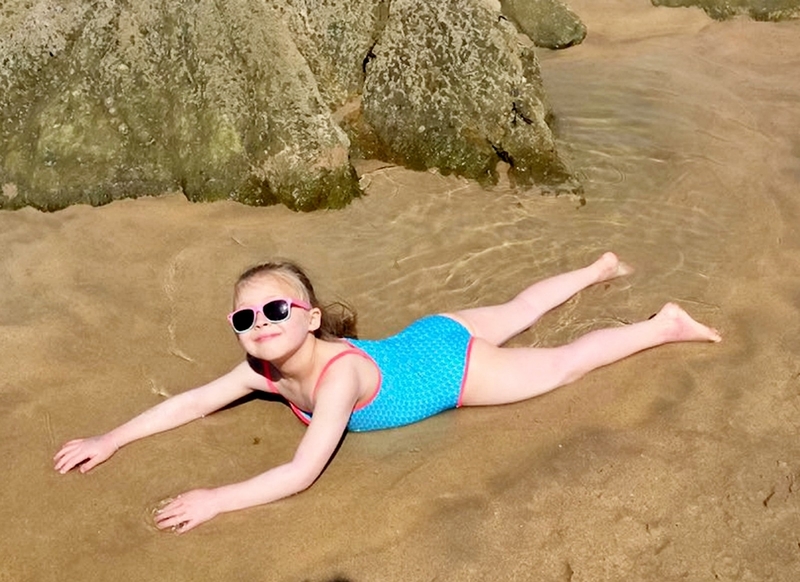 The schoolgirl was given antibiotics but Aimee took her to their GP after she noticed a rash on her skin when the family returned from Cornwall. She was rushed to Birmingham Children’s Hospital on June 27 where she was diagnosed with meningitis B. Doctors initially told her parents she would only lose the toes but yesterday (Wed) they told them the entire left foot would have to be amputated. 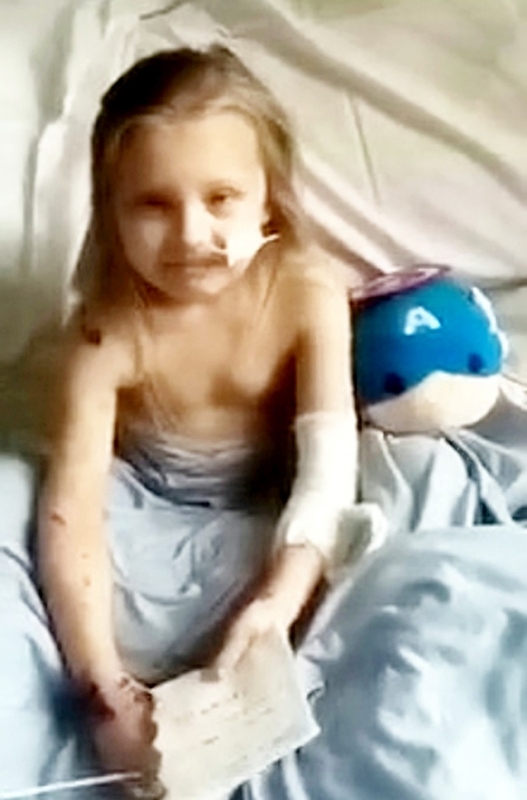 Despite her ordeal, brave Brogan-Lei has recorded a tear-jerking video message from her hospital bed thanking well-wishers. With her arm bandaged and rashes caused by the meningitis still visible, the youngster says: “Thank you everybody for being so kind. 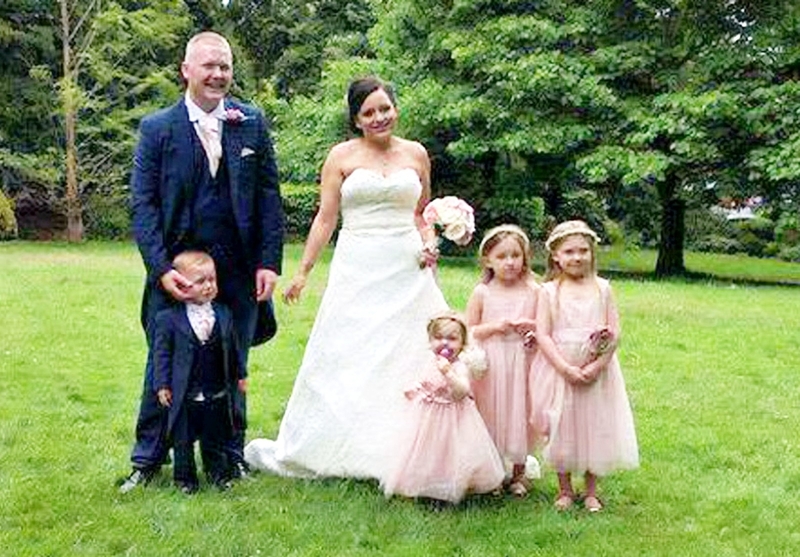 Aimee and Craig have been together for ten years and have three other children – son Harloe, two, and daughters Niabhy, five, and one-year-old Nualah. Aimee said: “She is well in herself. “The actual infection has gone now so she is over the worst of it, it is just the damage it has left behind. “We found out we are going to have to have her left foot amputated this week. We haven’t been told what day yet, it is up to the doctors and consultants to decided. “Her dad told her and she was actually relieved. She had got it into her head that she was going to die but she hadn’t told us that. “We were both at the hospital all day every day but now we are taking in turns so one of us can be with our other children too. Aimee’s cousin Lisa Reece, 28 from Castle Bromwich, Birmingham, said she couldn’t hold back the tears when she visited Brogan. She added: “Nothing can prepare you for what meningitis does to a body, let alone a little seven-year-old girl. “You see it in pictures but in reality, it’s much, much more than just a rash. Friends and relatives have now launched a fundraising campaign for Brogan and the children’s hospital which has raised £2,140 in just six days. A petition demanding all children be vaccinated against meningitis B, rather than only those in their first year of school, attracted 800,000 signatures earlier this year. Supplies of the live-saving meningitis B vaccine are now available on the shelves at chemists three months after stocks ran out. The shortage was sparked when parents rushed to vaccinate their children following the death of two-year-old Faye Burdett in February. The drug, which is called Bexsero, costs £95 per dose with a full vaccination requiring a course of two doses. * In February this year rugby star Matt Dawson, 43, posted images of his toddler son Sam battling the life-threatening disease. The former England scrum half described the ordeal as “two weeks of hell” and warned the images might be “upsetting”.